The Le’Express measuring spoon and bag clip is the must have accessory for any coffee lover. It is a small convenient tool that makes a world of difference to your brewing. Save money and space with this dual ended accessory that allows you to measure out the perfect amount of grounds and efficiently seal the bag. Accurately measure your grounds for cafetieres, stove top espresso makers, aeropress, espresso machines and more. 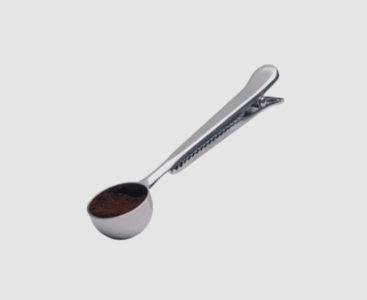 Make consistently delicious coffee and keep it fresh with this 2 in 1 measuring spoon and bag clip. Not only is this spoon a sleek and stylish addition to any kitchen, the stainless-steel material is also highly practical. Coffee is known to stain and washing accessories and brewing devices can be the most difficult part of our routines. Stainless steel is easy to look after and maintain a shiny, new appearance. It doesn’t fade, discolour or rust, which keeps it looking brand new. It also doesn’t absorb stains or odours, which allows it to be used for many years. Stainless steel is easy to clean and keep hygienic and it is a much safer material as it is fire resistant. An unopened bag can last months before it starts to lose its freshness. However, once you do open the bag, it can begin to lose flavour if not stored properly. Firstly, buying beans and grinding at home is the best way to get the freshest coffee possible. Although we roast and grind beans fresh every day at Adams and Russell, if you really want it as fresh as possible, try buying beans and grinding yourself. Use an air tight container to protect from moisture, high temperatures and excess sunlight. Keep in a cool, dry and dark cupboard. Buy from suppliers that use packaging with an air valve. After roasting, coffee continues to emit gases which needs to be released. This is why our packaging is specially designed with an air valve to allow these gases to be released. Use a clip rather than just folding the bag down. This is to ensure maximum freshness, even when stored in a container. It depends on your personal taste and how strong you like your coffee, but we recommend around 17g per cup. This is just over one tablespoon. If you’re looking for the best way to make consistent coffee for your business, take a look at our how to make consistent filter coffee for your business guide.